Situated half in New Jersey and half in New York, Greenwood Lake is not about political boundaries. It is a state of mind, a Highlands destination in the with the biggest water in the New York area. 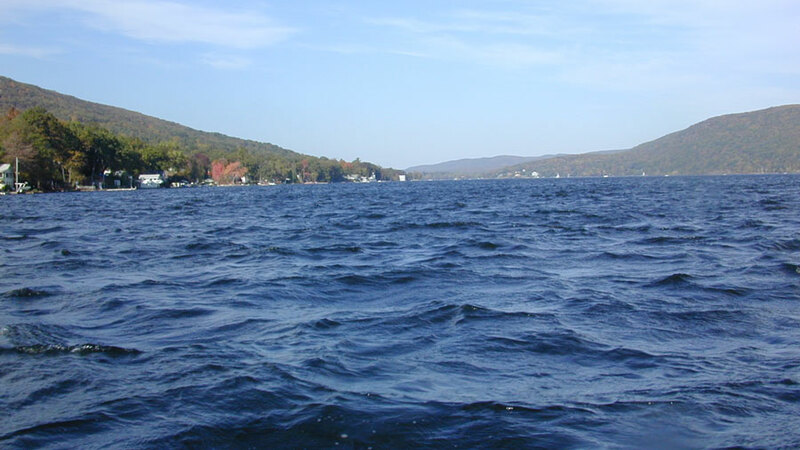 Beyond the shade of old sugar maples on its northern shore, Greenwood Lake stretches and waves for six to nine miles, depending on who you talk to. This glassine water body, made for pleasure, supports every water sport a visitor can think of – swimming, diving, fishing, water skiing, jet skiing, and boating by sail, canoe, kayak, paddle, motor, row, and skull. Greenwood is an important lake in the Skylands region. 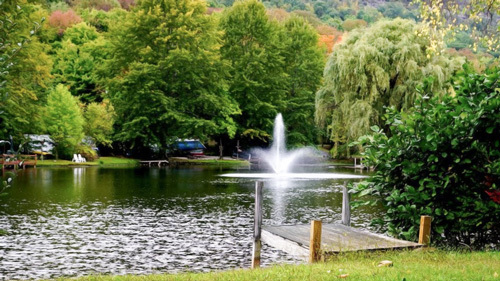 Historically known as a resort community and playground for celebrities – Cecil B. deMille, Babe Ruth, the Jeter family, and others in sports and the arts – Greenwood Lake still offers adventure, fun, and relaxation for families and singles. It and the surrounding Town of Warwick and nearby Vernon have everything a vacationer could want for a weekend or a week: entertainment, night life, antiquing, a wine trail, outdoor concerts, festivals, boutique shopping, restaurants with lakeside dining, cozy inns, plenty of outdoors activities, and hiking in national and state parks. A tour around Greenwood Lake reveals where to have some fun. From 17A south, turn right onto East Shore Drive to check out the East Arm of the lake. A boathouse on the right houses the East Arm Rowing Club, an organization that teaches new members, provides skulls, and sponsors a spring regatta on the lake. Along the drive, notice several marinas that rent slips for boats and also rent the boats themselves. Pass flashy restaurants of various styles. A 1914 castle at water’s edge, complete with haunting by ghosts of a past owner’s mistress and wife, has waterside dining and live music on the dock, beach volley ball, and for those who prefer indoors, a dining room with colorful murals and a wall of windows to watch the action on the lake. But back to the lake! Soon a grand home appears on Chapel Island where, years ago, a church accessible only by boat held services until it burned. Now the island is home to a judge and local orchard owner. In this Forest Knolls section of the lake, garages become the most visible structures on the road because the houses are down by the lake. Tree-lined hilly streets, and the lake as backdrop for stone and log houses with well tended gardens, lend a European flair to these private communities with their own beaches. So, if you want to swim, go to the town beach at Morahan Waterfront Park in the Village of Greenwood Lake. At about half-way down the lake, enter West Milford, New Jersey. Soon you will drive over the Wanaque River, the sole outlet of the lake. The river flows to Monksville Reservoir, then on to Wanaque Reservoir. Here, the Ryerson family dammed the lake in the 1830s, flooding several farms to create the southern half of the lake. (First, Peter Hasenclever, Long Pond ironmaster, dammed the middle of the lake in 1765.) Ryerson’s son was involved with the Morris Canal and Banking Company. After that, luxury steamboats plied the new lake, bringing visitors to the new grand hotels and resorts built on its shores. Rob Sparks, GIS Specialist for West Milford’s Planning Department, calculates that the current body of Greenwood Lake is 7.6 miles long at 620 feet elevation. By contrast, Upper Greenwood Lake on Bearfort Mountain is entirely a man-made lake at 1,100 feet elevation. This lengthy lake gets a lot of boating action. It’s even perfect for sailing and paddle-boating. Has the thought of learning to sail sailed across your mind? Here’s the perfect opportunity. At the T-intersection, turn right onto Greenwood Lake Turnpike. 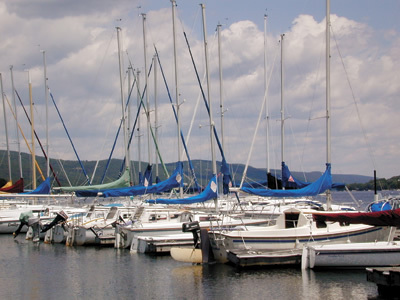 South Shore Marina, on the right, offers doable, inexpensive sailing lessons. They also rent pontoon boats! Want to learn how to fly? Take Airport Road to the left and find Greenwood Lake Airport. Take a ride in a small plane or sit in the Crossroads Café and watch take-offs and landings while you enjoy lunch. Next to the airport, check out what was once "Jungle Habitat,” a defunct Warner Brothers drive-thru safari open in 1972 and closed four years later after a wild cat killed a man. The sign and other artifacts remain, as do some interesting plantings of exotic species meant to enhance habitat of exotic animals. Most is overgrown now but it all makes hiking there fun, and some established, marked trails exist. To get maps for them, contact the New York-New Jersey Trail Conference. Another wonderful place to hike is Bearfort Mountain which runs along the western side of Greenwood Lake. 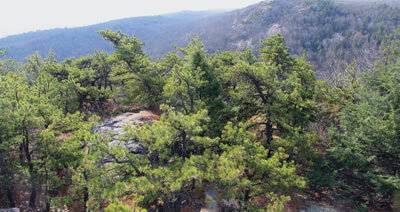 The mountain is part of the Abram S. Hewitt State Forest with exciting trails. This New Jersey-style adventure hike has fabulous views, fun rock-climbing, streams to ford, boulders to hop, waterfalls and habitats to explore, and lots of wild plant and animal life to watch for. It’s one of the Garden State’s best. Get a map from the NY-NJTC. 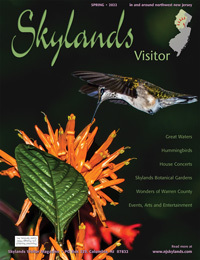 Ringwood State Park and the New Jersey Botanical Garden, New Jersey’s official botanical garden, are to the southeast. 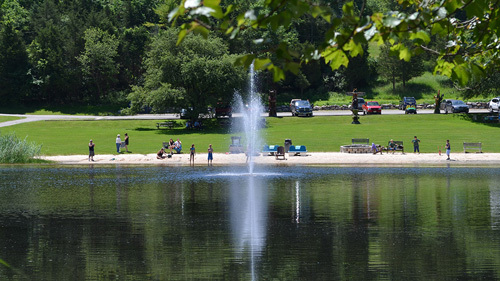 Back along the lake, check out Brown’s Point Park designed for a round of Frisbee or "disc golf” or a quiet picnic with kids who can swing in the playground A little further drive brings you into the center of West Milford with lots of stores for everything you need. After the diner, turn right onto Lakeside Road (Route 210) which hugs the lake back to the Village. Along the way, note stately homes, more marinas, and restaurants and clubs with lakeside dining and entertainment. In the mid 1960s and early ‘70s, when the New York drinking age was 18, Greenwood Lake’s streets were crowded with teens from New Jersey who came to the 80 plus bars and clubs here, according to locals. Now, most of the village’s nightlife is on the lake – and in summer, most bars and restaurants feature live bands outside on docks, where visitors can steer their boat right in. "The restaurants and bars that survived the ‘60s now continue the tradition of live entertainment on the lake,” says Tricia Anton, co-owner with husband, Robert, of Anton's on the Lake , a 12-room hotel built in 1875. In town, turn right onto Windermere Avenue that dead ends at the Greenwood Lake Public Beach. In summer, swimming, sunning, and getting married in the gazebo are the beach’s major attractions. Evening brings concerts, Saturdays at 7:30. Other festivals of note are Breezy Point Inn Winter Carnival, Annual Boat Parade, the Greenwood Lake Fall Festival, Classic & Wooden Boat Show, sponsored by The Antique & Classic Wood Boat Society in July, and Applefest in Warwick. Approximately 2,000 families live year-round in the Village of Greenwood Lake, one of three villages (and seven hamlets) in the 104 square-mile Town of Warwick. On a recent spring day at Anton’s, a young man and woman were married. "A lot of people have gotten married here over the years,” says Anton, who arranges weddings. "They bring the bride in by boat and they get married on the front lawn.” In fact, three years ago Anton’s cousin called from England to say she was coming to America to elope in Las Vegas. Anton told her she could get married in Greenwood Lake, right at her hotel. When the family arrived, they were brought in by boat up the lake and married on the lawn. "I did the whole wedding,” says Anton. "My husband was captain of the boat and my son was best man. I was matron of honor. All the boats were beeping their horns. Her father told me it was like a fairy tale wedding.” Anton’s Annex has cozy rooms with country flair with a puffy bed - the kind you want to cuddle up in. The rooms are cheery and well-arranged with three bottles of wine, a whirlpool and wine glasses on the side table. For an excursion to Vernon, for the day or week, take 17A toward Warwick. Bellvale Creamery on the top of Bearfort Mountain is a "must-stop,” even for hikers on the Appalachian Trail, which passes through from New Jersey into Harriman State Park. Their ice cream is beyond fabulous, attests this writer – homemade – with dangerously addictive, yummy flavors, (one with chunks of fudge inside) and the view over Warwick is great. Anton picks up hikers here who call ahead to stay a night or two off-trail for a bit of luxury – a comfy bed and shower. "We all like to live vicariously through the hikers. We’ve met so many nice people,” says Anton, who has taken them to get new boots and to doctors. "We shuttle them around. 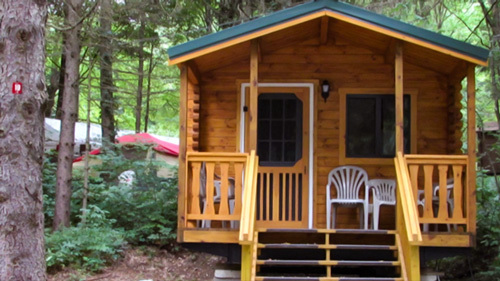 We do it because we like it.” If a visitor wants to do a one-way hike, Greenwood Lake Taxi Service will take her to the trailhead, or to Mountain Creek or any nearby attractions. In Warwick, turn left onto Route 94 and head toward Vernon. 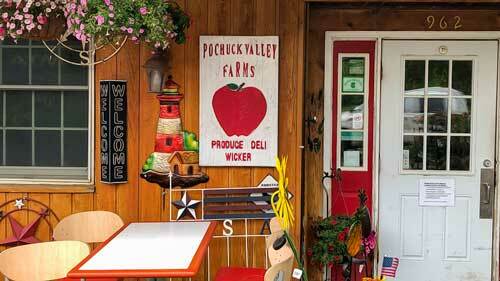 But while still in Warwick, another must-stop is Ochs Farm up the hill on the left for home-grown fruits and veggies and their very own peanut butter with honey, the best you will ever taste, bar none. For that alone, it’s worth the trip. You can explore the Warwick area for farms, pick-your-owns and wineries – many with live music outdoors.